Babylon (in Arabic: بابل; in Syriac: ܒܒܙܠ in Hebrew:בבל) was an ancient city in Mesopotamia (modern Al Hillah, Iraq), the ruins of which can be found in present-day Babil Province, about 80km south of Baghdad. The form Babylon is the Greek variant of Akkadian Babilu (bāb-ilû, meaning "Gateway of the god(s)", translating Sumerian KA2.DINGIR.RA). It was the "holy city" of Babylonia from around 2300 BC, and the seat of the Neo-Babylonian Empire from 612 BC. In the Bible, the name appears as בבל (Babel), interpreted by Genesis 11:9 to mean "confusion", from the verb balal, "to confuse". For the world at large Babylon ranks as one of the most famous cities of antiquity, renowned alike for its refinement, beauty and magnificence. As a centre of culture and government it flourished for about fifteen centuries, from the arrival of the Amorites ca. 1850 B.C. down to Alexander the Great, who died there in 322 B.C. One of the best known of the city's early rulers was the great law-giver, Hammurabi (1792-1750 B.C.). In classical times the city walls of Babylon were spoken of with admiration and astonishment, while her "Hanging Gardens" were accounted one of the Seven Wonders of the World. During the reign of Nebuchadnezzar II (605-563 B.C.) Babylon was extensively re-built on an altogether magnificent scale, the city becoming at this period both the most beautiful and the most prosperous of the ancient world. Bisected from north to south by the river Euphrates, the city was surrounded by a moat and by two massive walls, the outer being about 16 kilometres in length, the inner about 8 kilometres. Within the inner city wall were brick- and bitumen-paved Thoroughfares and imposing buildings, of which numerous traces and ruins may still be seen by the visitor today. 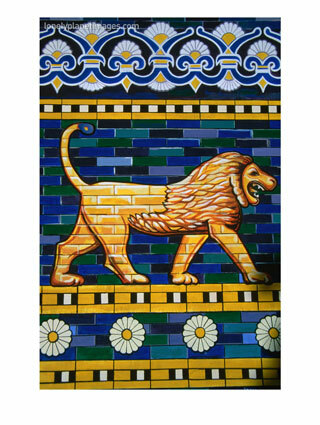 In particular there is part of Babylon's great Procession Street which passes through the Ishtar Gate and on towards the site of the city's huge staged temple tower or "Ziggurat". On one side of the Procession Street are the ruins of the South Palace (300 x 190 metres) amongst which are to be found those of the famous "Hanging Gardens" mentioned above. To the north of the South Palace are the ruins of the Principal Gate, the broken walls of which consist of baked bricks laid with gypsum mortar. Also within the circuit of the inner wall and surrounded by residential buildings are the temples of Marduk, Ishtar, Gula and Ninurta. For the past two thousand years the ancient buildings of Babylon have been extensively quarried for their excellent baked bricks. Thus, what survives today is generally only the lower courses of the walls or simply their foundations. Moreover, what survives is threatened by salt and the high local water table. Action is urgentls required to rescue these ruins. Fotunately there already exist plans and reconstructed drawings on many of Babylon's principal buildings, even some of which little now remains but their foundations. These plans and drawings were made by German archaeologists who dedicated some seventeen years to the excavation of Babylon before the First World War. As the product of fifteen centuries of human toil and endeavour Babylon belongs to all people and to all nations. Visitors from all over the world are anxious that something should be done to further the restorations and reconstruction of babylon's principal buildings, so that the city's former grandeur may be better appreciated. It is appropriate, we feel, that all countries should assist in this work, not only in recognition of Babylons' great place in history, but also in recognition of her great cultural importance for everyone.